Need for a gift for dear old Dad? 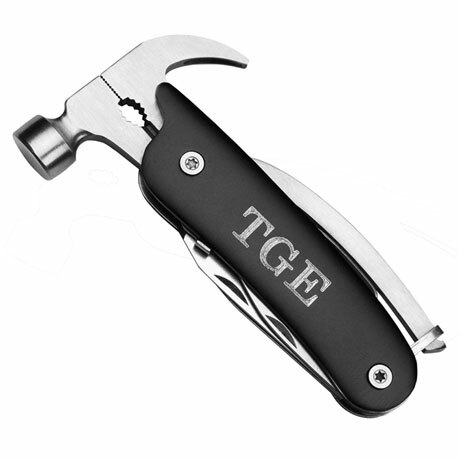 Look no further than this stainless steel hammer and multipurpose tool! 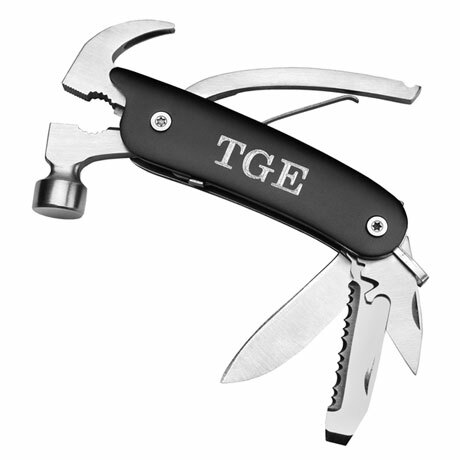 Sleek design with the following tool functions: hammer, pliers, 2.5" blade, 2.5" saw blade with file, flat head screwdriver, Phillips head screwdriver, bottle opener, reamer, and wire cutter. Tool measures 5.25" L x 3" W and includes black pouch to carry on a belt. Perfect gift for Father's Day, anniversary, or birthday. Personalize with up to 3 initials, in this order: first initial, middle initial, and last initial. Initials will be ordered in standard men's initial format, all the same size. For example, John Michael Smith would be JMS. Comes ready for gifting in a black gift box. No rush delivery.